Chinese New Year begins on February 5 and ends on February 19, 2019. In China, you may hear it being called chunjie (春节), or the Spring Festival. This holiday marks the end of the coldest days and has people welcoming spring and what it brings along: planting and harvests, new beginnings and fresh starts. Though the Spring Festival is 15 days, celebrations start on New Year’s Eve, making it 16 days. The most important part of Chinese New Year is the family reunion. Everyone should come back home for the New Year’s Eve dinner. This causes a large migration of people from cities to the countries as most elderly parents live in rural villages. Families thoroughly clean their homes to sweep away ill-fortune and make way for incoming good luck. Windows and doors are decorated with red paper-cuts and couplets with popular themes of good fortune, happiness, wealth, and longevity. Activities include lighting firecrackers and giving money in red paper envelopes. The Richmond Public Library – Join the library for a Chinese New Year celebration, and explore Chinese New Year history, traditions, the associated myths and customs and the cultures behind it. The Vancouver Public Library – Join artist Meng Xiaoping as he talks about six-thousand-year old Chinese brush painting and demonstrates the basic skills of using a Chinese calligraphy brush. Come and paint your first Chinese plum blossom for the upcoming Year of the Pig, a year of prosperity. Conducted in Mandarin and English. 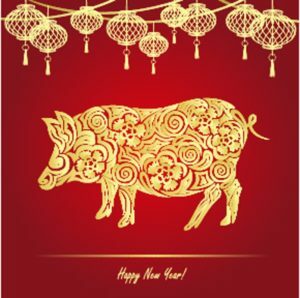 The Burnaby Public Library – Families, teens and adults are invited to drop in to make a lantern and welcome in the year of the pig. Supplies are limited, please arrive early. Ages 6 and up. No registration required. The Fraser Valley Regional Library – Invites everyone to help celebrate the Lunar New Year! Taste some New Year’s foods and enjoy Chinese dance. Children can make a craft and a lucky envelope. Of course, you won’t want to miss the 46th annual Vancouver Chinatown Spring Festival Parade. This signature event of Vancouver’s Chinatown will feature lion dances, cultural dance troupes, marching bands, martial arts performances and much more. This is an annual cultural extravaganza not to be missed. The parade will begin at 11 am. The Year of the Pig in the Chinese Lunar calendar will begin on Monday, February 4th in 2019. Come see the sights and hear the sounds of the festivities!